On a flat track South Africa kept up with the run rate in their reply but lost too many wickets and were stuck on 250 for five after 33.3 overs when the rain came. Carrying home hopes was wicketkeeper-batsman Quinton de Kock who struck a career-best unbeaten 138 from 96 balls. South Africa’s reply came at a good pace, but only Faf du Plessis (55) offered De Kock any support as the pair shared a 110-run stand for the second wicket. 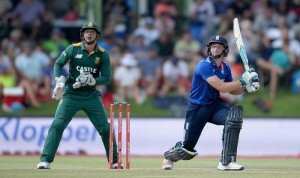 Scores: England 399 for 9 (Buttler 107, Hales 57, Stokes 57, Root 52) beat South Africa 250 for 5 (de Kock 138*, du Plessis 55, Moeen 3-43) by 39 runs (DLS method).